of owning a German Shepherd. Remember, GSD training is an important part of owning your dog. As a German Shepherd owner, you own one of the greatest potential athletes, and one of the smartest dog breeds, in the entire dog world. Well rounded, these dogs were created on the premise that the dog be versatile, athletic, courageous and mentally sound to excel in any activity in which they participated. Before taking your German Shepherd to the next level however, it is best to first make sure that your dog is physically fit by your veterinarian. Your vet will check your GSD's overall health and well being as well as it's lungs, heart and joints for any potential problems. Once you get a good bill of health from your veterinarian, the next thing to do is to start training your GSD. Start GSD training slowly with a short exercise periods a few times daily. There are many excellent ways to build up your German Shepherd's endurance - swimming, walking and playing fetch are all good ways to start. If your dog stops frequently, pants heavily, limps or shows any sign of pain then take heed, these are all clues that your dog is not yet ready for more vigorous activity. Don't have the time to train your German Shepherd yourself? Looking for someone to train your dog for you? This is a possibility too if you don't have the time and skill to do it yourself and can afford to hire someone else to do it for you. But be forewarned, these highly trained dog trainers will cost you a pretty penny.There are many dog training schools located all over which offer this service for both dogs and dog trainers - so if you are serious about hiring a trainer, there are many places and dog trainers to choose from. But if you are more of a do-it-yourself kind of person, there are also many dog training books, TV shows and online courses available too that offer loads of GSD training tips. And if you decide to go this route, I will list a few dog training internet courses below that you might be interested in checking out further right now. And why am I listing more than one kind of dog training course? Because everyone learns a different way - some people like videos, some like audio training and some like to read. So now you have a choice depending on which method you prefer most. There are many different types of activities and training which are available for you and your GSD to participate in. 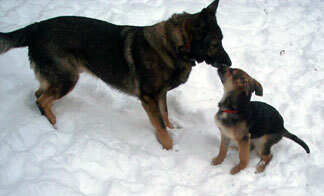 There are also many actual working dog activities that your German Shepherd can participate in. GSD jobs are an important part of the work force the world over - especially in the areas of military and police work. In the links below we will attempt to briefly examine and explain what each activity is and also what is involved in participating in each. Remember, of all breeds, the German Shepherd dog is the most versatile. He can do it all and do it all well. Often it is the owner who must check his own limitations versus that of the GSD. Of all the various types of GSD training available, you are sure to find one or more that is right for both you and your German Shepherd. Here are a few more training resources that you might want to check into if you're interested in training your German Shepherd further.